Training for leaders and free gear loans are helping urban families and youth hike and camp for the first time. 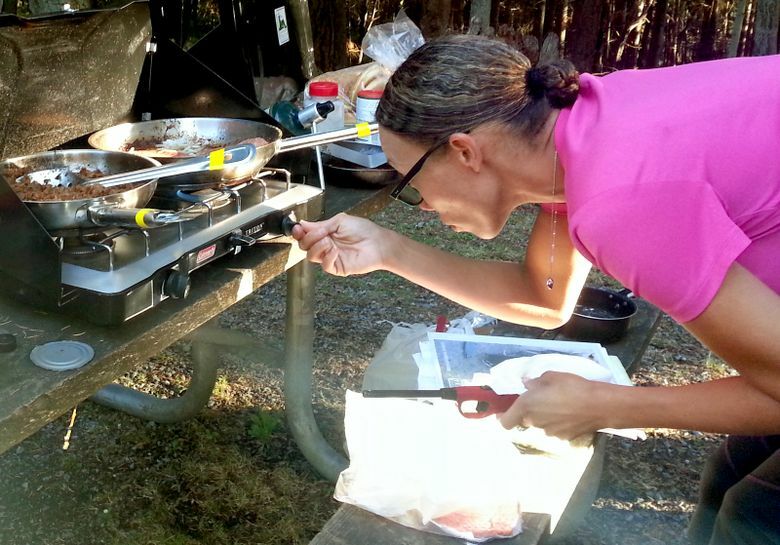 With both soy-meat and ground-beef options, Renee Pierce and Gladys Martinez, both of the North Seattle Family Resource Center, were cooking a hearty meal at Camano Island State Park for eight families, most of whom had never been camping before. The families all wanted the recipe afterward, said Pierce. But the three-bean recipe wasn’t hers — it came, along with 14 tents, 29 sleeping bags, two Coleman stoves, and a session of outdoor wilderness training for Pierce and Martinez, from the Washington Trails Association (WTA), the nonprofit best known for its website used widely by hikers searching for their next mountain adventure. To use the Washington Trails Association Gear Library, with equipment available year-round, group leaders must complete a workshop in WTA’s Outdoor Leadership Training program. It offers hiking and camping workshops ($25-$40) for teachers and community-center leaders interested in taking youth groups outdoors. Workshop grads have free access to the Gear Library’s camping and hiking gear for trips for school-aged youth. “The families, they were like, ‘Oh! How do you make this?’ ” said Pierce, a summer program coordinator for the resource center. “Keep it simple,” answered Andrew Pringle, who runs the WTA’s outdoor leadership training program with an emphasis on the basics of outdoors skills. Since the fall of 2013, Pringle has taught local community center leaders and schoolteachers the skills needed to take large groups hiking and camping. 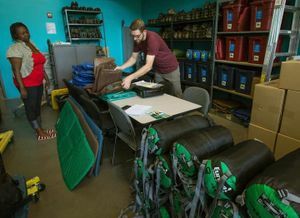 Graduates of his program planning youth-group trips have free access to WTA’s Gear Library, which is stocked with everything from hiking boots to snowshoes to Coleman stoves in a storefront in Seattle’s Mount Baker neighborhood. They can also apply for a grant of up to $250 annually to help with other expenses. “We’re not trying to promote the idea that (campers and hikers) need brand-new equipment to enjoy the outdoors, but you do need appropriate gear,” said Pringle. The library is aimed at outfitting school-age youths who may not otherwise have access to gear. Participants have ranged from Highline High School to the YMCA. But it’s open to any community group, which is why, on a recent Sunday, 30 people of varying ages, interests, and ethnicities descended on a wooded group campsite and sparkling beaches on Camano Island. As for the chili, Pringle intended it as a “one-pot recipe” that makes camping that much less stressful and more unifying for new campers. “It’s really, I think, the meals where everybody comes together and you get a sense of community,” he said. For the North Seattle Family Resource Center, the outing was a way to let families get out of their neighborhood and explore the state, said Martinez, who works with teen parents at the center. “Their radius is just like Lake City and that’s it … so to take them out here is really taking them out of their comfort zone,” she said. 1. Heat olive oil in a large saucepan over medium-high heat. 2. Add onion, bell pepper, and garlic to pan; sauté 3 minutes. 3. Stir in water and next nine ingredients (through diced tomatoes); bring to a boil. 4. Reduce heat, and simmer 10+ minutes. 5. Remove from heat; stir in cilantro. Serve with sour cream. Some could not have afforded equipment, while others were new to the Washington outdoors. Yet others were busy parents for whom summer programs at the center are a welcome diversion. Rao Vidadala, a research associate in chemistry at the University of Washington, said the provision of tents and supplies on this trip was an incentive for him to take time off. “I’m doing research every day … so sometimes we have to dedicate (a) few hours to family,” he said, before being called away by a child who required his attention. Jing Jing Huang and Yun Peng said they were happy to take their son, William Peng, camping for the first time. At their blue WTA tent, William was busy playing a variation on hide-and-seek with a friend. Sleeping outside for the first time “he will feel the nature and stuff, so I mean, it is a new experience for him,” said Yun Peng, adding he was pleased that the family could be together without the distractions of technology. But as the gathering shifted from the chili cooking table to a table where Bollywood music issued from a set of wireless speakers, it was not entirely clear that the group had escaped the tech world. Vidadala was the culprit — the son of his friend Srikanth Kokkonda had just had his seventh birthday, and it was time to celebrate. He started teaching Renee Pierce and her friend Candise Gross to sway their hips to the beat. Pretty soon everyone had left their tents and gathered around to cheer them on. Those who didn’t join bonded through lighthearted commentary. It’s getting harder and harder to get out in nature, isn’t it? “Or if you’re out in nature, to really be in tune with nature!” quipped Pierce. Pierce learned about the WTA Gear Library through a contact at Seattle Parks Department. At the leadership training, she was surprised to learn that the camping skills she’d learned growing up were not enough to lead a youth group into the outdoors. You needed to scout the site before planning your trip, looking for hazards, she learned; keep cooking efficient by breaking into groups; use different wash basins for hot water and disinfectant, and touch base with rangers, so you know whom to contact in case of emergency. WTA staff gave her insights into finding the right camping spot. She and Martinez networked with grocery stores and food banks for the chili ingredients, as the grant was only enough to cover campsite fees. It was a lot of work, Pierce said. After most of the kids had gone to bed, Pierce reflected about the trip. She was happy, but just a little ticked that they didn’t follow Pringle’s guidelines to a tee. “We were supposed to have an icebreaker … but they were like, ‘we want to dance,’ ” she said. However, she observed that the outing wasn’t about telling parents what to do, but about letting families figure out how to camp on their own.